emmatree: the past. still here. almost gone in yesterday's sunlight, here today in the rain. 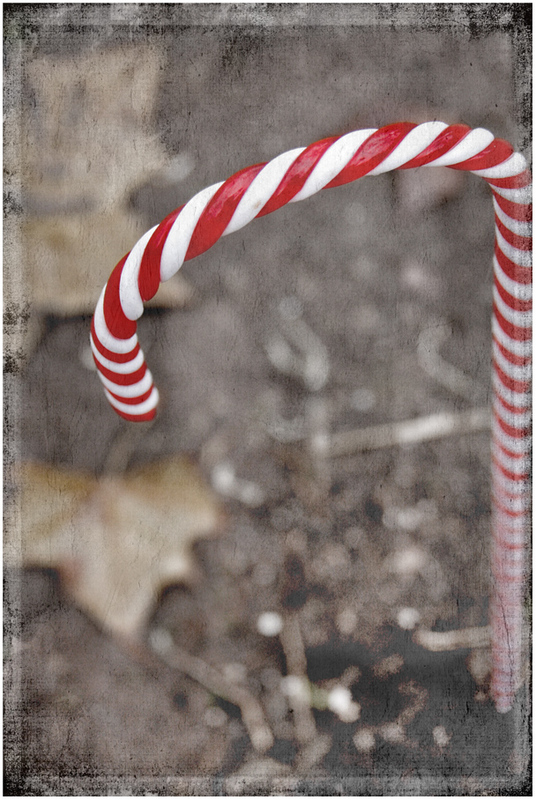 outside, across the street, the leftover candy canes, ghosts of christmas past and today's rain, go almost invisible in morning sunshine and afternoon shadows, only there if you squint your eyes hard against the brightness. but this morning is gray and drizzled with rain and they stand proud against the green of the house, pieces of the past, of last year. inside, on the television, midnight in paris, man ray, hemingway, picasso. the past. a sign that says santa was here. she had a friend with unwritten rules to be followed, like invisible cracks in a sidewalk. it was inevitable that one day she would step on one. the friend will only hint at such, but birthday and christmas cards will stop arriving and the phone will stop ringing, and it will matter not that it wasn't her fault, that it was just one of those things in a year of those things. the friend will light a match to the bridge that has connected them for 30 years and at first the flames will sputter in her tears of apology, but she will eventually, and surprisingly quickly, stop crying, and let it burn. she will be surprised at the relief she feels. she will stop watching the sidewalk and keep walking. i'd thought to stop writing this year, or to write about the things that kept me silent for so much of last year, knowing i would lose friends, but determined to do it nonetheless. silence is not always golden. i'd thought i would start immediately if i were to do it, on january 1st, and i'd thought to start with how it felt to be called a racist over and over, how it hurt when people posted terrible things on facebook or twitter, and called people names, how when i questioned such things i was always told i don't mean you, i just mean people who vote like you. i'd thought to write about the exhaustion of feeling that hatred. i'd thought to write true and hard things. then came magic. once again. hold out your hands - i've said it for years - and catch the gifts the universe is tossing your way. last year i closed my hands against the ugly words and i missed too many gifts. i gave those words, and the people who said them, power. this year i take that power back. i open my hands to this keyboard, to pens and pencils and paper, to rain and to sunshine. i open my hands to magic and truth. expect both black and white. “The past stays on you the way powdered sugar stays on your fingers. I love you and I love your words and I love your power. and back to you. you have been an inspiration all year. truth. must apparently tread lightly, or at least it seems I MUST, while others choose to say whatever they may to ME. AMEN to your post. Amen. Take the power back! That is my intention for this year. And also to let the past injustices go. In letting it go, i take back my power again. Great post emmatree. i am proud of you. Somehow the magic showed up just at the right time. Of course, that's because it's magic. Holding my hands out, catching whatever falls my way. This made me smile. Your power is in your words. i read your words carefully, because mine have been held in silence. who wants to hear about the ongoing subtleties of grief anymore? and that is all i have, busy-ness and little griefs. I totally understand the whole politics thing and I'm glad you chose to take "back the power."